With views looking out across the Sacramento Valley and into the mountains beyond, the cool clean spring air inspired us to relax and enjoy the ambience as much as the granite boulders beckoned to be climbed. There was something here for each of us, shallow water filled puddles to splash around in after the previous day's rainfall, and boulders sized for smaller bodies as well as the large boulders that had actually led us herein the first place. 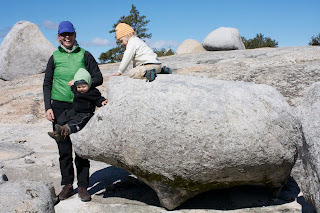 Although we arrived in search of boulders for myself, this granite playground gave us much more. At just over a year old, even Frêney was inspired to climb. As rewarding as it was to feel the granite with my fingertips and solve the few problems I was able to, as always it is our children that leave me inspired and fulfilled at the end of the day. They continue to remind us of the simple pleasures and adventures that can be found in nature. It's inspiring to observe our children when they are given the freedom to explore and watch how they are able to create their own experiences. At the end of the day, we didn't want to leave, and with no appointments or commitments, spontaneity allowed us to fetch our tent and sleeping bags and sleep under the stars again appreciative of the time we are blessed to be able to spend together and seek out and explore such natural beauty.